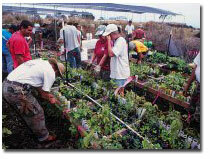 HFIA has been managing the Ka‘ūpūlehu Dryland Forest Restoration since 1993. The outreach and education program Ho‘ola Ka Makana‘a (Healing the Place Budding Out of the Lava) involves restoring an endangered 76-acre dryland forest and sharing its historical, cultural, restoration, and scientific aspects with Hawaii’s youth. Youth receive hands-on, land-based, environmental and cultural learning experiences to effect positive change in the areas of responsibility, stewardship, and interdependency of all living things. In 2009, HFIA expanded it outreach efforts to Kalaemanō Cultural Center and in 2010 to La‘i‘Ōpua Preserve in a collaborative project, Ka Pilina Poina ‘Ole “Connection Not Forgotten”. The Cultural Ecology Team is providing retoration and education all the project sites. Ethnobiologist Jill Wagner provides seed collection, propagation, species selections, and outplanting assistance. For ancient Hawaiians, the forests of these islands literally meant life itself. From them they gathered the resources and drew the spiritual inspiration that were the cornerstones of their culture. The native dryland forests were a bounteous source of diverse plant materials used in vessels, implements, food gathering, fishing, shelter, medicines and rituals. Lowland dry forests were located on the dry leeward coasts between 300 to 1,500 feet in elevation, an area the ancient Hawaiians called the wao lama. Sadly, 90 percent of Hawaii's native dryland forests has been lost due to human activities such as land clearing, wildfires, and the introduction of alien species that have had disruptive and harmful effects. Today, the remaining dry forests continue to be degraded and fragmented by land development, deforestation, fire, alien plant species, rodent predation and grazing by domestic and feral livestock. The native plants found here cling to a precarious existence: approximately half of Hawaii's endangered plant species are from dry and semidry environments.In the last decade, for both biological and cultural reasons, there has been a renewed and urgent sense of stewardship for these declining forests. A concerted effort to restore them is under way in the Ka'upulehu ahupua'a in North Kona on the Big Island of Hawai'i. Here, an organization called the North Kona Dry Forest Working Group (DFWG) is carrying out two demonstration restoration projects. The DFWG evolved from the concerns shared by many local citizens who approached the Hawai'i Forest Industry Association and the U.S. 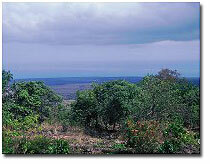 Fish and Wildlife Service about protecting and managing the remnant dryland forests in North Kona. 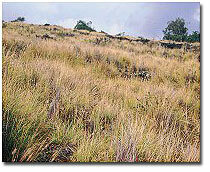 Most of the landscape in the Ka'upulehu dryland forest is dominated by an introduced ornamental grass common to drier leeward areas of the Big Island. Fountain grass (Pennisetum setaceum) is an aggressive invader that suppresses the native vegetation and fuels dangerous wildfires that have proved devastating to native species. Eliminating the fountain grass and maintaining the site is extremely labor intensive. Existing grass must be cut back to its base and treated with herbicide. Once the fountain grass is dead, native species find it easier to become established and survive. Seedlings can be planted and irrigated to supplement natural regeneration. Although invasive plants still require manual and chemical control, the work becomes less intensive as the natural system recovers. Firebreaks, rodent control and fences to prevent grazing are also critical to protect the recovering forest. A six-acre parcel in the upper Ka'upulehu region, fenced as a forest reserve in the 1950's, has been restored by various strategies since 1995. Fountain grass and other invasive have been controlled, 200 native trees have been planted, irrigation has been installed, and fire and rodent control measures are in place. Because of these efforts, the site has become one of the highest quality native dry forests in Hawai'i. With this success, the focus of the DFWG shifted to a larger 70-acre parcel in the lower Ka'upulehu region. Here the DFWG has been working to duplicate the success of the smaller parcel on a larger scale, striving to develop techniques that can be practically applied across the larger landscape by private landowners and government agencies. Like the ancient Hawaiians, the aim of the DFWG is to provide ongoing stewardship in both restoring and preserving these dry forest lands. The Group is testing methods of eliminating fountain grass, reducing fire hazards, maintaining fences and irrigation lines and identifying factors influencing natural regeneration.The results of this research are continually shared with the public and professionals through on-site field trips, seminars, workshops and publications. Combined with other dry forest restoration efforts statewide, this work will stimulate interest in and knowledge of the biological and cultural significance of native Hawaiian dry forests both in Hawai'i and elsewhere. Accomplishments to date are the result of hard work by volunteers and cooperating agencies' staff with funding support from government, private and scientific organizations. To effectively implement the results of the research, greater public participation and additional funding are needed. The DFWG also seeks to form partnerships with additional landowners interested in implementing their own projects. This will permit continued development of a cost-effective model of dry forest restoration. With the support of so many and those yet to join us, we believe the dryland forests can survive and once again thrive. We respectfully ask you to join our efforts and help bring to fruition the words of the original stewards of Hawaii's lands: E ola ' may there be life.